Shooting sporting clays is a great outdoors activity, but it requires an extraordinary amount of care in transporting firearms. Usually expensive, high-quality firearms are used and need protection from damage. Secondly, safety is of extreme importance---the firearms need to be positioned and handled to prevent accidents. Great Day's QD804SC UTV Gun Rack is designed to fit all popular utility vehicles that include cargo beds. It attaches securely to the sides of the cargo bed with use of lag screws or bolts positioning gun holders for two firearms on each side. The gun holders are strategically placed at an upward angle to prevent the firearms from being pointed at participants or bystanders. This product is also ideal for outfitters for safely transporting clients and their firearms to hunting areas. 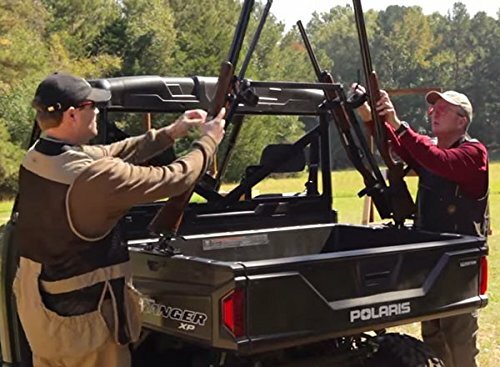 The Great Day UTV Sporting Clay Gun Rack is framed in heavy-duty aircraft aluminum and includes cushioned gun clips that can be set at different heights and are moldable to conform to size of the firearms.